UNFORTUNATELY THIS TOUR WON’T BE AVAILABLE FOR THE COMING YEAR DUE TO THE MAJOR EARTHQUAKE THAT HAS HIT THIS REGION. HOPING THAT AS MUCH AS POSSIBLE WILL BE RESTORED AS SOON AS POSSIBLE, AND KNOWING THAT FOR A FULL SOCIO-ECONOMIC RECOVERY THIS REGION NEEDS TOURISM, WE WILL KEEP THIS TOUR ON-LINE, HOPING TO BE ABLE TO OFFER IT AS SOON AS POSSIBLE AGAIN. 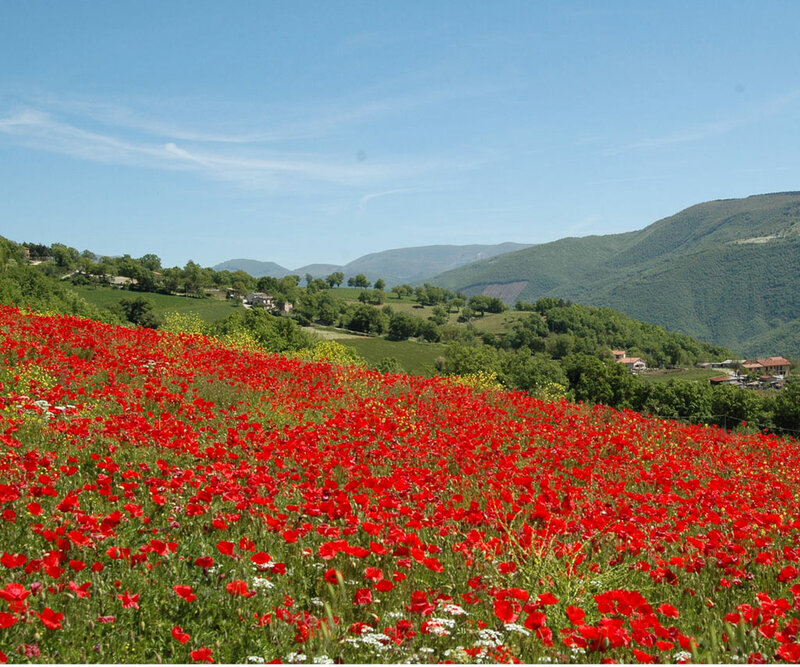 IN THE MEANWHILE WE DO CONTINUE TO OFFER OUR OTHER UMBRIA TOUR (‘ALONG THE TRAILS OF ST. FRANCIS‘), ENCOURAGING OUR CLIENTS NOT TO DESERT THIS BEAUTIFUL REGION, FOR WHICH TOURISM IS A VITAL RESOURCE. Italy has a ‘Green Heart’, where it is a real pleasure to walk through the lovely countryside. Not as famous as the Tuscan landscape, but perhaps more genuine and at least equally beautiful ! 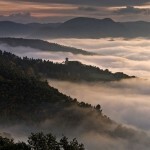 You walk from village to village, a full immersion in the mythical Umbrian landscape. At first through forests and vineyards, then through the rolling hills between the spectacular hilltop towns of Trevi, Spello and Assisi. 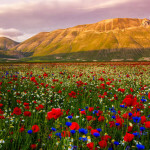 A short detour is made to the wonderful high plain of Castelluccio, near Norcia, with its extensive meadows, fields of wheat and wild flowers. 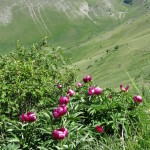 Walking here in Spring is an unforgettable experience! 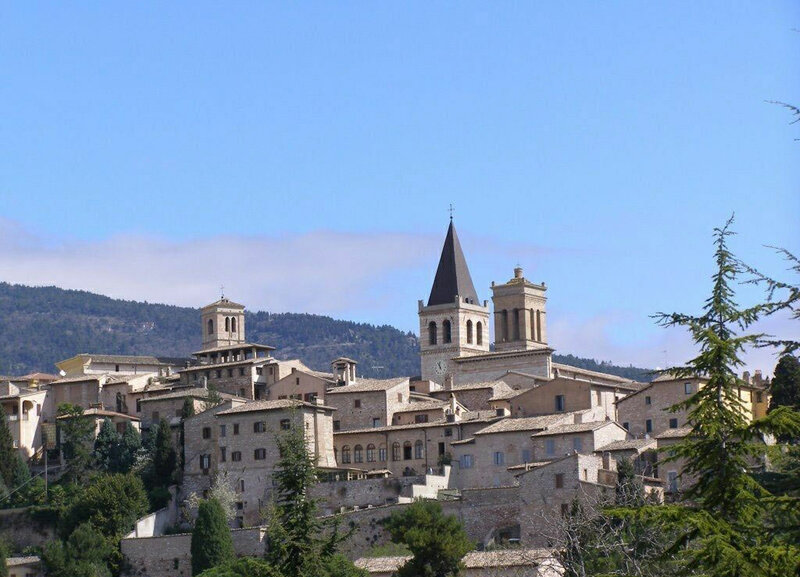 Moreover Umbria is a land full of cultural treasures, ranging from the world famous Assisi, with its impressive basilica dedicated to St. Francis, to lesser known small medieval towns like Trevi, Spello and Norcia, and of course the wonderful Roman town of Spoleto. You have of course ample time to visit these historic towns and of course also the many beautiful medieval monasteries along the pilgrim’s roads. 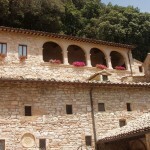 For two nights you stay in one of the most beautiful monasteries. However the emphasis of the tour is to enjoy the countryside, the rolling vineyards, poppies in spring and the wild cyclamen in autumn. Most of all, many of the views have changed little for hundreds of years. 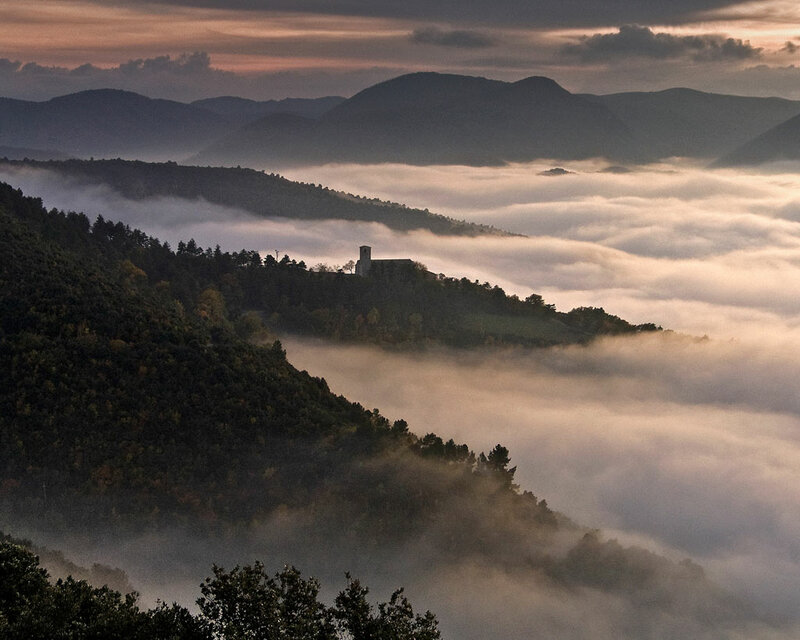 Eastern Umbria is still an area where you feel the genuine heart of Italy. You’ll walk at an easy pace from highlight to highlight, taking in the best of Central Italy. 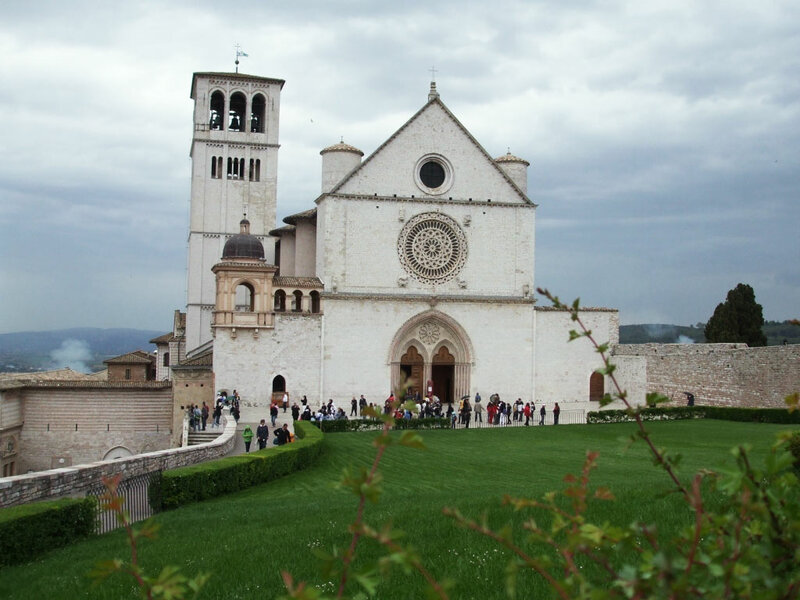 Our tour finishes in the city of Assisi, but can easily be extended with a day or more in Perugia, the region’s capital city, a beautiful and lively cultural capital. This is a moderately easy tour which is suitable for those who have some experience with walking and a good general physical condition. 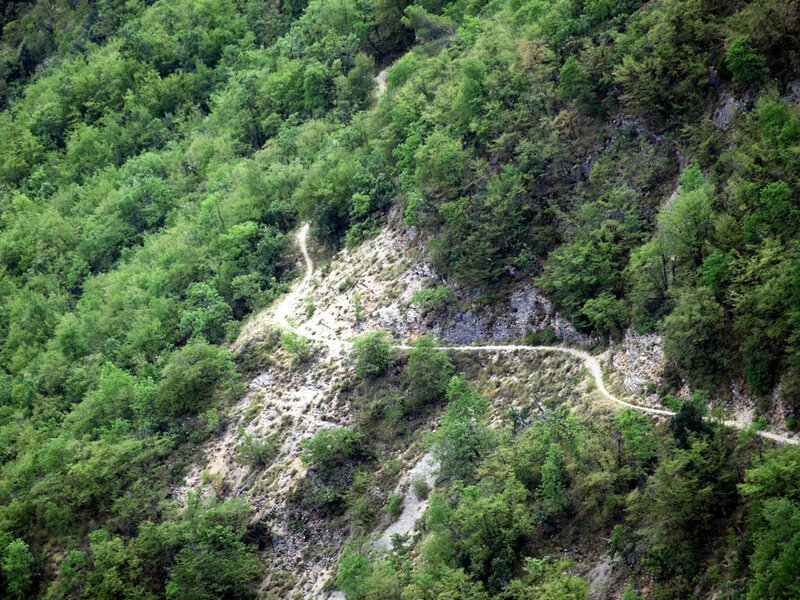 Through the extensive footpath network of the area, roughly following the traces of the medieval pilgrims’ path from Assisi to Rome and the Roman Via Flaminia, one of Europe’s most important ‘high ways’ in Roman times. 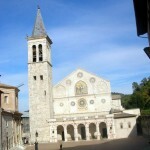 Arrival by train in Spoleto and transfer to the hotel (either by private taxi or public transport). Your hotel is located in the heart of the old town, known for its beautiful churches and many Roman monuments. And also a very pleasant city to go for an afternoon walk or evening stroll. According to your arrival time, you can go for a short visit to the town centre. In the evening you eat at the restaurant of the hotel. The famous ‘Ponte delle Torri’ is a marvel illuminated at night! 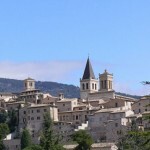 The first day walk takes you at first through the whole historical town centre of Spoleto and to its fortress. 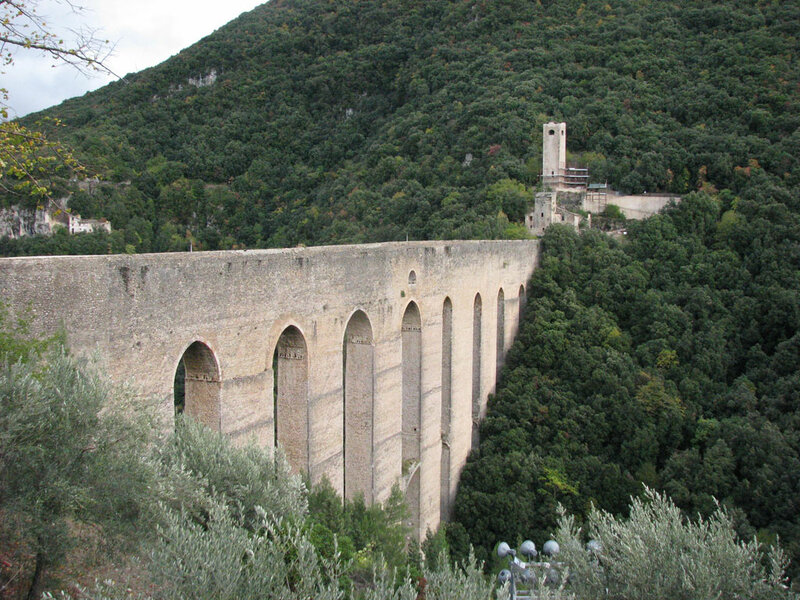 Then you walk across the impressive ‘Ponte delle Torri’ bridge, a unique aqueduct, to the other side of the valley, onto the hill of Monteluco. 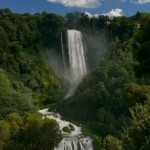 Here you make a very pleasant roundwalk through the forested hills, with wonderful views on Spoleto and its surroundings. The hill of Monteluco is known to be a ‘holy mountain’ and many of the trails are linked to the spiritual history of the area. Here you can discover the ‘holy forest’ with its many grottoes and wander along medieval chapels through a pleasant wooden landscape.. Then you descend back into the valley of Spoleto again, and along the medieval chapel of San Pietro you return to the old town. Total walking time: around 4 hours + sightseeing time (5 hours with extra option). After breakfast you begin your long walk, which will bring you into the Valnerina, the wonderful valley of the Nera river. First you cross the Ponte delle Torri again, but now you follow the beautiful path along the acqueduct, with great views on Spoleto. Then you follow the waymarked trail into the small valley of the Val Cieca, the ‘blind valley’, uphill until you reach the Castelmonte pass. From here it goes downhill again and in the early afternoon you reach the small hamlet of Cese. 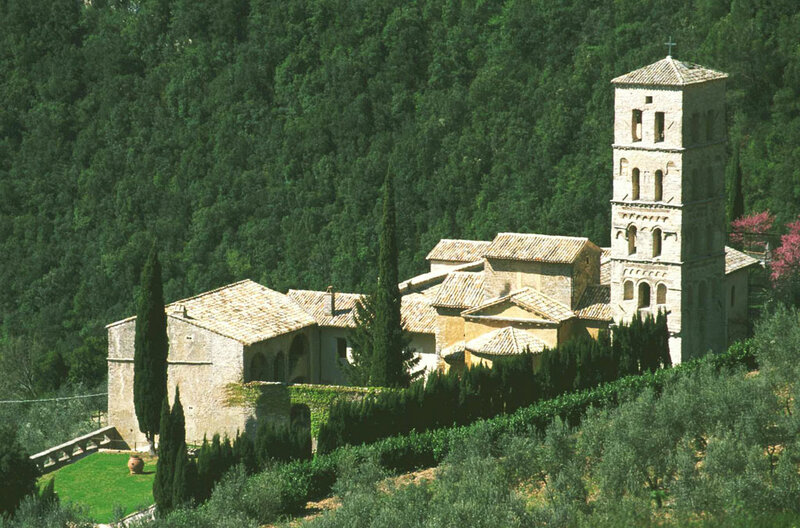 Continue the walk through the forested hills and towards the end of the afternoon you reach the beautiful Abbey of San Pietro in Valle, now a historical country residence. Here you’ll stay for the next two nights. At night you have a good meal directly here at the restaurant of the abbey. Total walking time: around 6 hours (circa 2 h. less if you opt for a transfer). Today you leave the abbey, heading towards the West. You now walk through the narrowest part of the Nera valley, which until not long ago was almost completely cut off from the outer world and therefore virtually untouched. 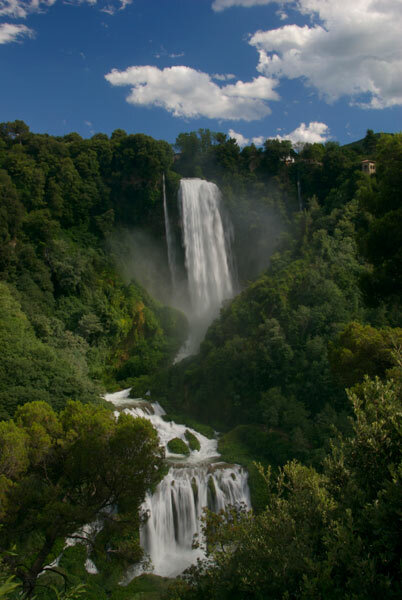 Along several charming hamlets, following the pilgrim’s trail from Assisi to Rome, you reach one of the wonders of central Italy: the Marmore waterfalls. These waterfalls, about 165 metres high offer a unique visual and acoustic experience. And the most intriguing fact about them is that they were actually manmade in Roman times… You can make a wonderful roundwalk in the area, walking from viewpoint to viewpoint. After some time for contemplation or a drink at the waterfalls, you return either by bus or private taxi to your base at the abbey. 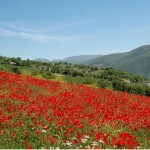 In the morning you are being picked up by your private taxi for a transfer to the wonderful small village of Preci. From here a beautiful route leads up to the majestic Abbey of San Eutizio, one of the most beautiful of the region. From there you then follow yet another medieval muletrack which first ascends steadily on the hillside, with great views over the valley below. 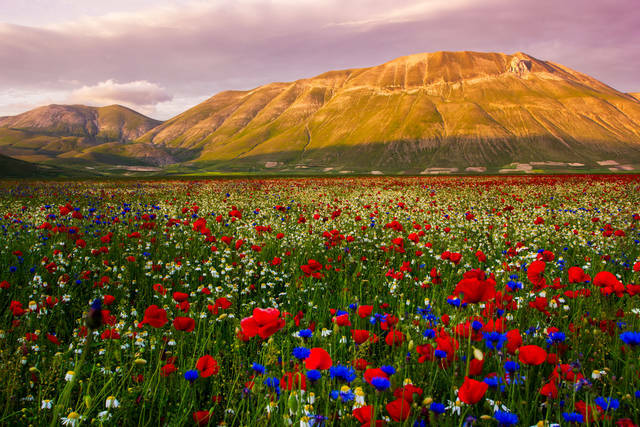 Once gained the Ancarano pass, the views open over the plain of Norcia and a beautiful descend brings you straight to the town walls of this wonderful small town, birthplace of St. Benedict. Today you make a wonderful roundwalk into the heart of the Sibillini mountains, starting directly from Norcia. You walk partly through forested areas, partly through a pretty rural landscape. 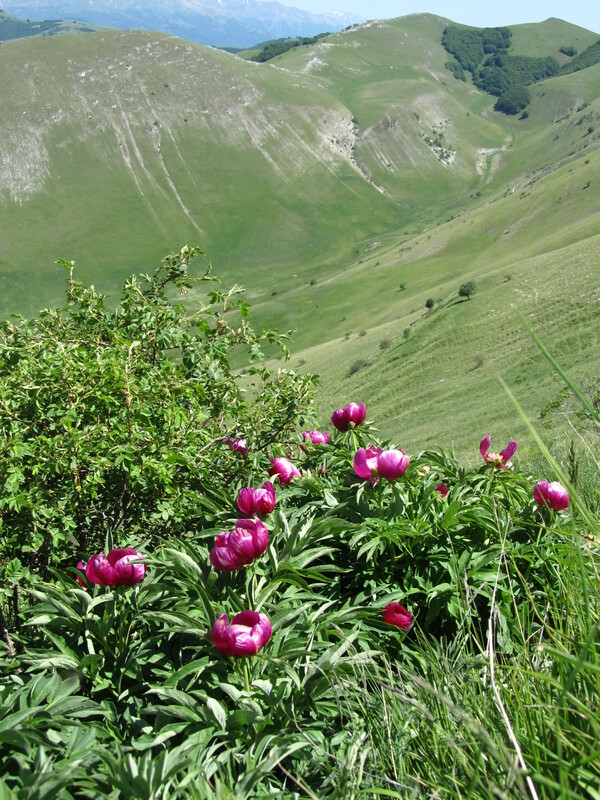 Then you walk a stretch along the ridge, with great views over Norcia and the Piano Grande (‘Great Plain’), with its meadows full of wildflowers, always spectacular, but especially in Spring. 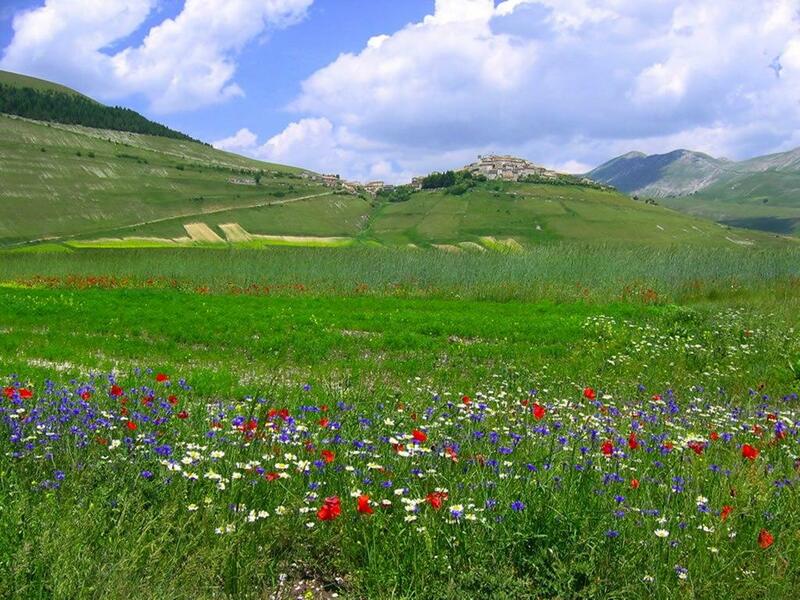 Your path leads you to the tiny village of Castelluccio, overlooking the Piano Grande. 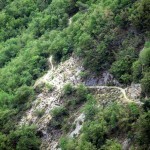 Then you descend back to Norcia, along an equally beautiful path. To shorten the walk, you can also opt for a transfer to gain some height. Today you first make a short transfer either to Poreta or to Bazzano Superiore, in case you wish to make a slightly longer walk. 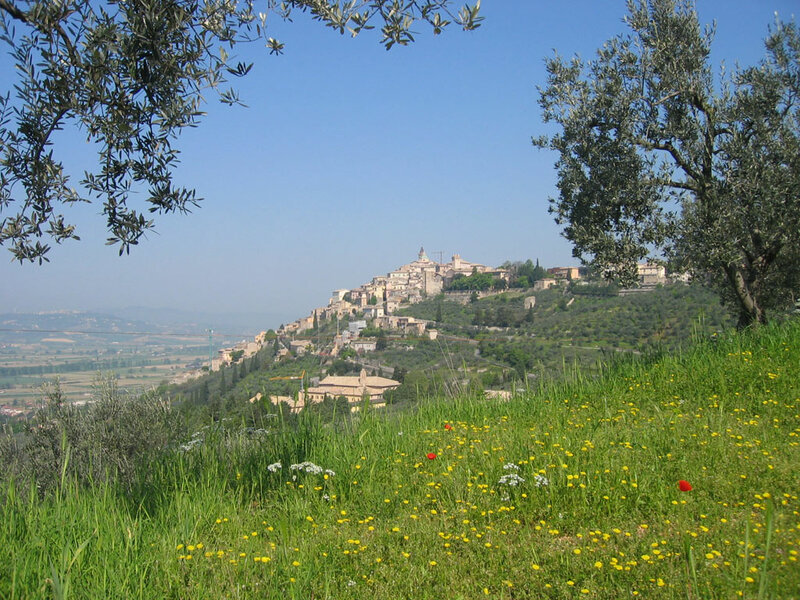 From one of these places you start your walk in northern direction, again along the medieval trails that link Assisi to Rome. 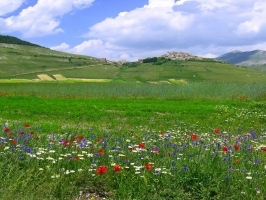 Depending on the walk you wish to make (more or less up&downs) you can opt for a route through the hills, scattered with remains of medieval castles and walled hamlets, or descend into the valley and discover the mythical springs of the Clitunno river, believed to be divine waters in Roman times. Your goal for today is the beautiful small town of Trevi, one of the most charming villages of central Italy, overlooking the Valle Umbra and moreover famous for its crystal clear spring water. Here you settle in your hotel for the night. You settle in one of the quiet, comfortable rooms. In the evening you can dine in one the nearby restaurants in the old town centre or directly at your hotel. Total walking time: around 4,5 hours + sightseeing time (6 hours with extra option). From Trevi you’ll have a short transfer to the old Roman town of Spello, according to many one of the most charming villages in the area. Take your time to drink a coffee here and then walk uphill, all the way through the old town centre, located on a ridge. After having passed the medieval town walls, the ridge continues and you continue your walk uphill, now through the olive groves. 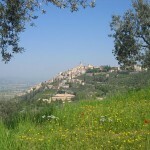 According to your energy level you can opt for either the walk over the ridge of the Monte Subasio, or (recommended) stay at a lower level and walk through pleasant countryside, with great views over the valley and the city of Assisi, yet another highlight of this tour and the goal for today. 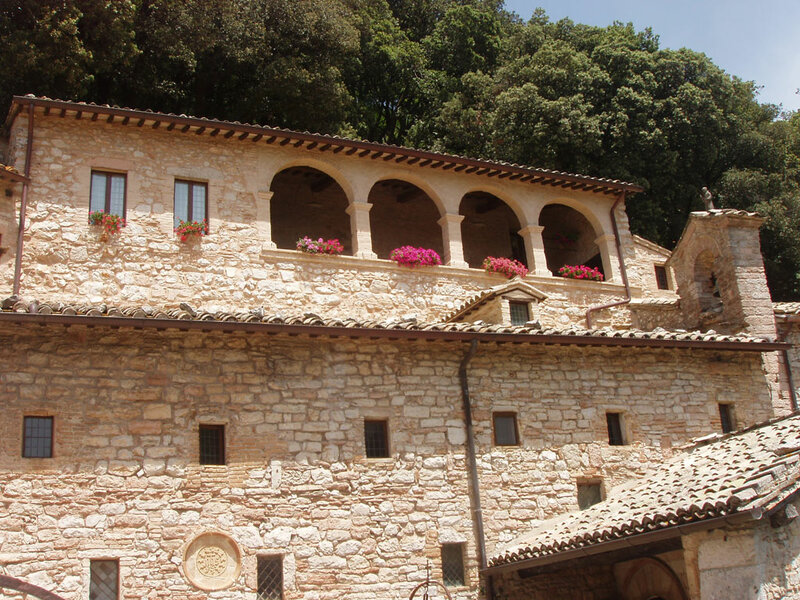 In the afternoon you reach the Eremo delle Carceri, the place where St. Francis, and after him many others, sought spiritual relief, now a beautiful small monastery with nice surrounding garden. From here you have the possibility to either continue the walk all the way down or take the bus to downtown Assisi, where you will stay the last two nights. Total walking time: around 6 hours + sightseeing time (longer option: + 1,5 – 2,5 hours). After breakfast you can take your time to explore the city. 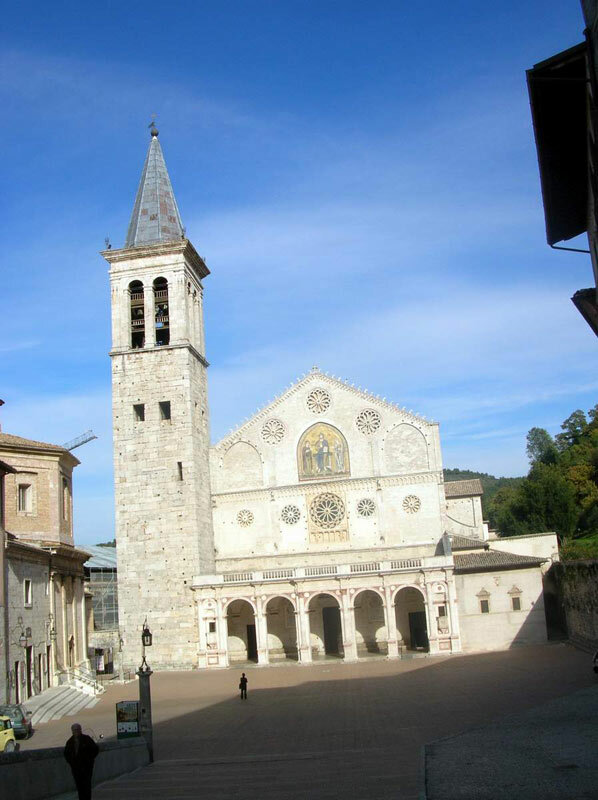 The city is full of highlights, among which of course, the Basilica of San Francesco d’Assisi (St. Francis), with its wonderful fresco’s by Giotto, a World Heritage Site. But also the other churches, the Greek temple of the central square and the underground Roman Forum are worth a visit. For those who want to do another short walk to conclude their walking holiday in style it is recommended to take the bus to the Eremo delle Carceri and from there undertake the ascent of Mt. Subasio. Here a beautiful roundwalk along natural springs and small chapels can be made, before re-descending to the historical heart of Assisi, for the last supper in Umbria. End of the tour. From Assisi centre there are buses to the train station, from where there are regular trains to Rome and Florence. Accommodation is partly on Half Board, partly on a Bed&Breakfast basis in good 3/4-star hotels and 2 nights in a historical residence (4-star level). All rooms have en-suite facilities. 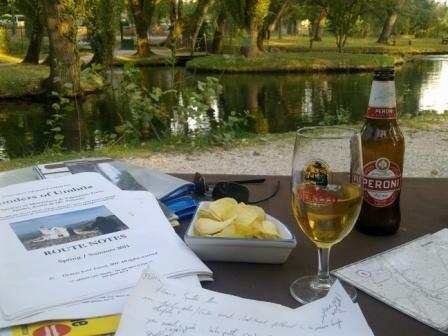 Dinners are included on the arrival night in Spoleto, the first night in the abbey of San Pietro(in a fine restaurant) , the first night in Norcia and the first night in Assisi. On the others nights, you will be free to organise your own dinner. You can either eat at the premises of the hotel or choose from the wide choice of restaurants in the area. Your accommodation holder can give you good tips. No picnic lunches are included in the tour price, but these can be prepared for you by the accommodation holders, or materials for picnics can be purchased in the villages where you stay. Nights 1 & 2: The first two nights you stay in the wonderful small town of Spoleto, full of Roman and medieval history, in a nice 3-star hotel right in the historical centre. Night 3 & 4: You stay in an exclusive hotel in the ancient abbey of San Pietro, located on in the green valley of the river Nera, the Valnerina. A wonderful and quiet setting. Nights 5 & 6: These nights you stay in a nice 3-star hotel in the historical centre of the quaint town of Norcia. On the premises of the hotel there is a good restaurant which serves local specialties. 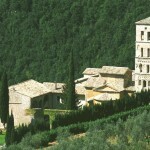 Night 7: For one night you stay in the historical town of Trevi, overlooking the Valle Umbra. According to your choice, you stay in a beautiful 4-star hotel in the historical centre or in nice 3-star hotel with a big garden. Night 8 & 9: The last nights are spent in a nice 3-star hotel in the centre of Assisi. It is set in a quiet location, yet at walking distance from all the main monuments. Moderate (2/3): Mostly easy walks, but with nonetheless some walking uphill, sometimes steeply and on paths with rough surfaces. On some days some stretches are difficult for those suffering from vertigo (but NOT dangerous !). On these days alternative options are available. Extensions or shortcuts are also possible on many days. Most paths are well maintained, but during the season some paths can get overgrown (we are in continuous contact with local authorities to keep the paths clean – please help us by providing you feedback on the quality of the paths). 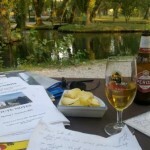 Arrival: The tour starts in SPOLETO. 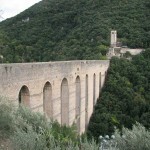 Spoleto can easily be reached by train from Rome (about 1 hour by train). A pick-up service can be arranged from the station to the hotel (about 10 minutes away). 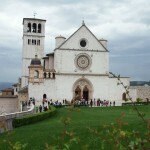 Departure: The tour ends after breakfast on day 10 in ASSISI. A short transfer brings you to the train station (included), from where you travel back to either Perugia (extension), Florence or Rome, all easily reachable. It is possible to include extra nights in any of the accommodations ‘en route’. Extra walking and/or sightseeing options will be provided ! 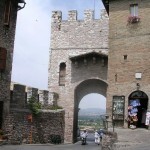 As well is it possible to extend your tour with a few days in Perugia, the regional capital, a beautiful and lively city. Also extra nights in either Florence or Rome can be booked at the end of the tour. Details and prices on request. It is possible to include extra nights in any of the accommodations ‘en route’. Extra walking and/or sightseeing options will be provided ! A SHORTER VERSION OF THIS TOUR IS AVAILABLE. 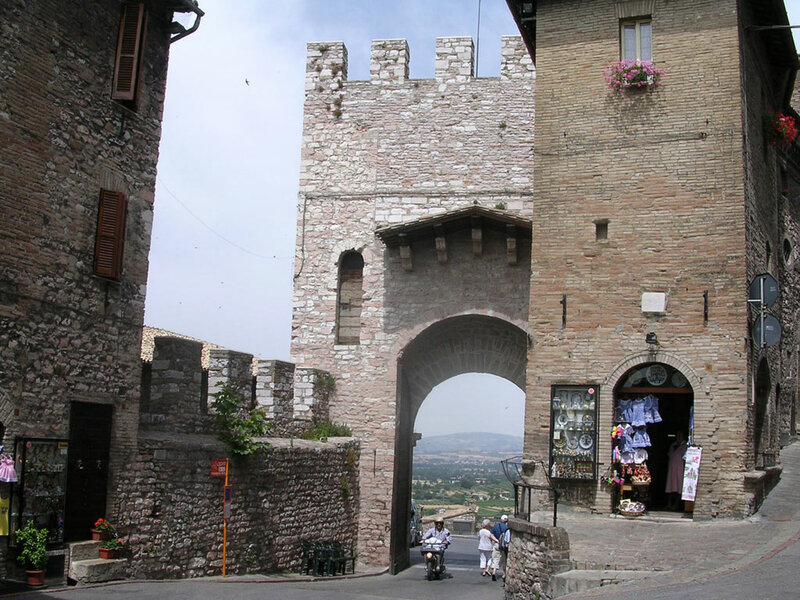 As well is it possible to extend your tour with a few days in Perugia, the regional capital, a beautiful and lively city.